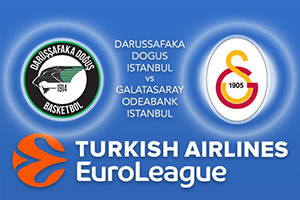 We have yet another Istanbul derby in a Euroleague double-header but this may not be as interesting or as exciting as some of the other games we have enjoyed so far this season. The away team have already been eliminated from the playoff running while the hosts know they need to keep on winning and hope other results go in their favour. There is no way that Darussafaka can confirm a playoff spot thus midweek but they could find themselves ruled out if they lose this game and then find out that Crvena Zvezda win later on Friday. It’s been a tough run of form for Darussafaka of late, losing two from three games, and this is a time when teams really need to pick up their play. There is also the fact that Galatasaray won the earlier clash of these sides, which was the firm time the two Istanbul sides had met in European action. That game, which took place in Round 8, finished 85-81 to Galatasaray with 22 points picked up by Tibor Pleiss. Galatasaray have managed to win three of their four most recent outings but this good form has come far too late in the season to give them any hope of progressing in the tournament. The hosts will look towards Brad Wanamaker for offensive play with Wanamaker offering 15.2 points per game so far this season. Will Clyburn has also chipped in to good effect so far this season, offering an average of 12.8 points per game. For Galatasaray, Vladimir Micov, with an average of 11.1 points per game and Sinan Guler, the captain with an average of 10.4 points per game so far this season, need to stand up and be counted in the latest Istanbul derby. The bookies think the hosts will edge it so take Galatasaray Odeabank Istanbul at +8.5 which can be found at odds of 1.90. For the Over/Under market, go OVER 154.0 at odds of 1.90, which should be suitable if the last Euroleague outing between these teams is anything to go by. Bet Now!